Connecting a printer to an Arduino « Adafruit Industries – Makers, hackers, artists, designers and engineers! As someone who has actually made a working printer solution for the Arduino (one of the very few, from what I can tell), it’s still my opinion the solution below is optimum, as of this writing. The parallel to serial conversions and Arduino pin-count issues make the parallel approach a non-starter. MOD1: Bend shield pins 0 and 1 so they do not plug into the Arduino TTY dedicated digital IO pins. This allows the Arduino serial com to remain available to USB debugging. MOD3: Add a reset button to the RESET and GND pins. Grrr. The shield completely covers the Arduino reset button. Who designs things this way? 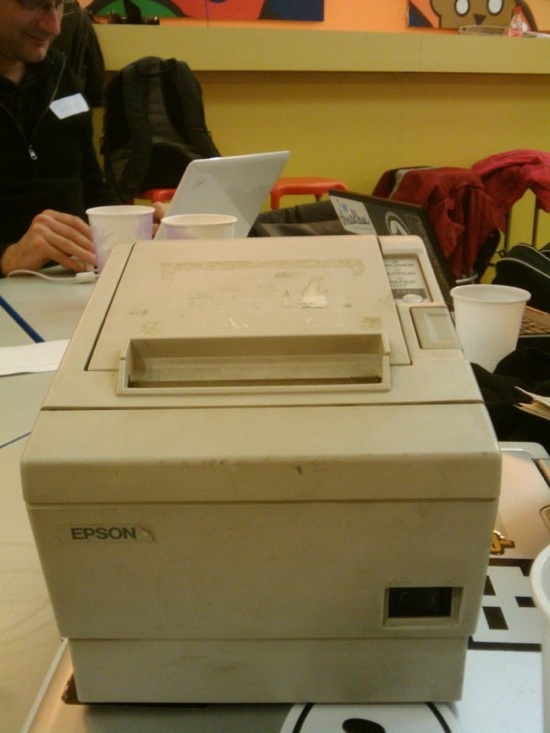 2) Plug in your receipt printer to the DB9 pin of the shield and start churning out paper. Believe it or not, it’s that simple. Why someone hasn’t make a decent printer shield is beyond me. I spoke with the support person for the RS232 shield about the issues, and he responded to me as if I were speaking Martian. It took me a year to find this solution. Enjoy.